On April 1, the Academy of American Poets will kick off its 2nd annual celebration of "30 Days, 30 Poets" for National Poetry Month. This April, 30 dynamic poets will take over curation of the Academy's Tumblr. Each featured poet will have 24 hours to post an array of ephemera—in the form of text, images, audio, and video—before passing the baton. 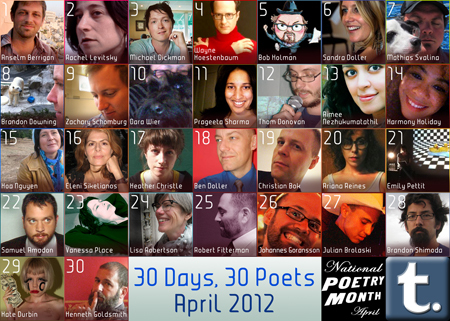 The Tumblr takeover follows 2011's lauded "30 Days, 30 Poets" on the Academy's Twitter feed. This online poet marathon initiates a series of events taking place during National Poetry Month, including the publication of the Academy's newly redesigned journal, American Poet, the star-studded 10th Anniversary of Poetry & The Creative Mind (April 5) at Lincoln Center, and Poem in Your Pocket Day (April 26). Follow the Academy of American Poets on Tumblr to keep up-to-date on the latest poetry posts: http://poetsorg.tumblr.com.